Ageing life and pensions administration systems can be prohibitively costly to replace. However, Admin Plus does not require a major overhaul of your existing systems. Admin Plus’s modern component based architecture allows you to replace legacy functionality in a measured and low risk manner and enjoy the benefits in as little as 20 weeks. Industry leading levels of configuration provide you with high levels of self-sufficiency and reduces dependency on external vendors. Admin Plus enables new levels of process automation, straight through processing and business process flexibility. Speed to market for new products – by configuring new products using the Exaxe industry leading Product Development Application (PDA). Flexibility – to launch and amend new products / variants as required for new and existing business. Reduced administrative costs – Straight Through Processing (STP). Improved customer service – faster turnaround, reduced errors, and improved data quality. Allows access by your customers and IFA’s to enquiry and self-service transactions. Rapid implementation – can take as little as 20 weeks to implement. Cost and process efficiency – reduced transaction costs and greater process efficiencies by reducing manual processes and duplicate data entry. 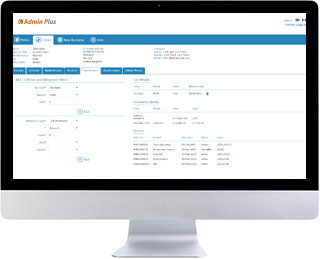 Click here to see the main features of Admin Plus!